Known as "Music City", Nashville has evolved beyond music but a top travel destination with a unique culture, very friendly people, rich history and a rising gastronomic scene. We booked a weekend trip to celebrate my best friend's birthday in her hometown and picked our top 5 must do's in Nashville. Nicknamed the "Athens of the South", Nashville's Centennial Park stands the full-scale replica of The Parthenon, a direct recreation of the ancient structure in Athens. This was such a treat for us as we were just in Athens, Greece to see the ancient ruins prior to our Nashville visit. This visit took us back in time and an opportunity for a glimpse of what the the ancient structure would have looked like in its complete state. Inside The Parthenon is a direct recreation of the 42-foot statue of Athena. The original statue of Athena was made of gold and ivory. Through history, her gold was stripped to pay for war, looted and destroyed through the eras. The existence of the statue of Athena was meticulously recorded through history but unfortunately no remaining pieces are found today. Tickets are $6 for adults, $4 for children and free for members to enter. The Parthenon is opened Tuesday-Sunday. Closed Mondays. The Loveless Cafe is a homey cafe and restaurant with a history of more than sixty years of serving true southern comfort food. 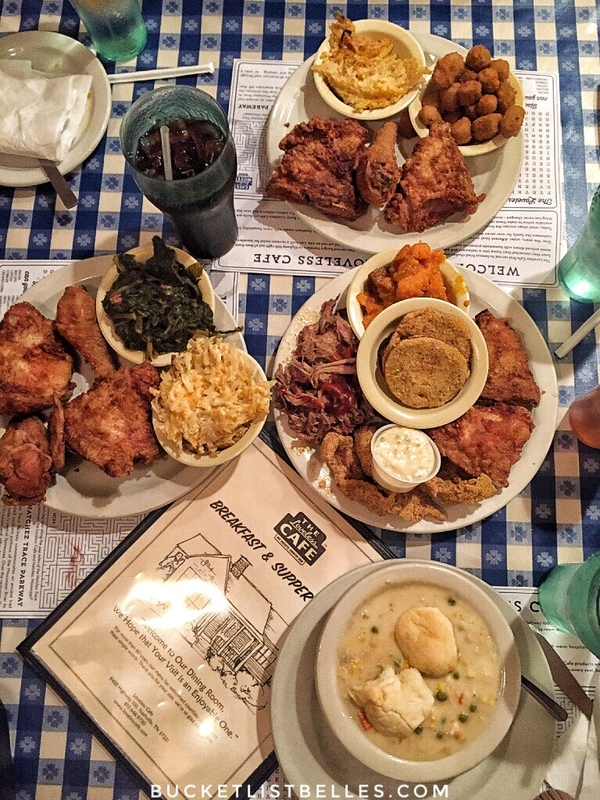 We waited 20 minutes for a table and ordered a feast of southern favorites. I especially enjoyed the biscuits (comes with butter and two jams), fried chicken, sweet potatoes and half-sweet tea. Everything else came out of the kitchen hot but mediocre in taste. However, I do recommend coming here for a local dining experience and would absolutely choose Loveless Cafe (over the famed The Pancake Pantry). Everything at The Pancake Pantry from food to service was subpar - we waited 45 minutes to be seated, ordered immediately and it took 30 minutes for 6 average pancakes to come out. After chatting with locals over the weekend, unfortunately it seems like The Pancake Pantry is a tourist trap. We didn't get to try Hattie B's Hot Chicken as the line was wrapped around the block and a tasting menu experience at Catbird Seat this trip. It is on our list for our next visit! Loveless Cafe is opened 7 days a week for breakfast, lunch and dinner. We stopped by Belle Meade Plantation for a Southern plantation tour and an afternoon history lesson. The aristocratic Harding family lived on this plantation for many generations and made their fortune in elite horse breeding among other businesses. Every horse to race in the Kentucky Derby since 2003 can trace their bloodlines directly back to Belle Meade, including famous horses: Seabiscuit, Secretariat and Barbarro. Tickets are $20 per person which includes a 30-45 min plantation tour and wine tasting at Belle Meade Winery. We found a Groupon deal for $32 for plantation tour and wine tasting for 4 people. Although there were only the three of us, we still saved with this deal and gave the 4th ticket away to the person behind us in line. We highly recommend a visit to Belle Meade Plantation. After our 45-minute plantation tour, the group was led to Belle Meade Winery for a complimentary wine tasting. We tasted 5 or so different wines and especially liked the two pictured below: Gentlemen's Blend and The Muscadine. The Winery can ship the bottles at $12, we decided not to pay the shipping fee and put the bottles in our luggage. Huge mistake!! We forgot Delta charges $20 to check in a bag (UGH DELTA!) AND constantly worried the two bottles will break during our flight and stain all my clothes. Lesson: not worth it. Pay up the $12 shipping fee if you buy wine. We bought a very nice red: Gentlemen's Blend and a sweet, desert-like wine: The Muscadine. Belle Meade Winery also offers annual wine membership. 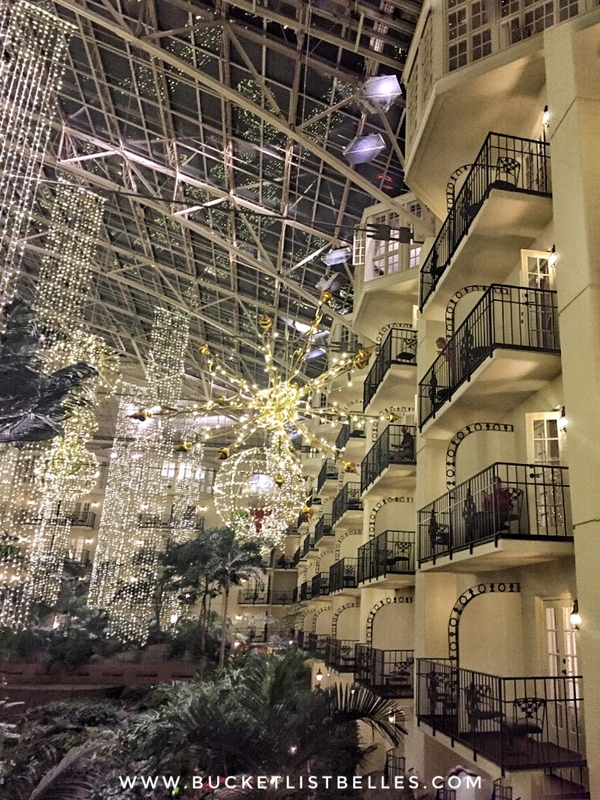 We were told that Gaylord Opryland Resort & Convention is a hotel but also unlike any other hotels at the same time. What does that mean? We had no idea so naturally, we had to see it for ourselves. Once we stepped in, I understood exactly what everyone was saying. Everything in Opryland is huge and an eclectic combination of well, everything. The holiday decorations are hung from ceiling to the floors, an indoor greenhouse of more than 10,000 plants engulf the entire space as well as a spa, 5 restaurants and 580 hotel rooms. It felt a little like a family-friendly Vegas in some ways. Insider Tip: Park your car for free at the Opryland Mall next door (5-minute walk to the resort) and avoid $24+tax parking at Opryland Resort. Holiday decorations at Opryland among the plants and restaurants. What's interesting is that the hotel room balconies view out to the public space. You can see hotel guests relaxing on their balconies, viewing the holiday decorations and lush vegetation and of course, people watching. We hope to stay at Opryland the next time we visit Nashville. Opryland Resort is operated by Marriott International and rooms can be booked here. Hotel guest rooms view out into the lush vegetation and public spaces. What is Nashville without live music? 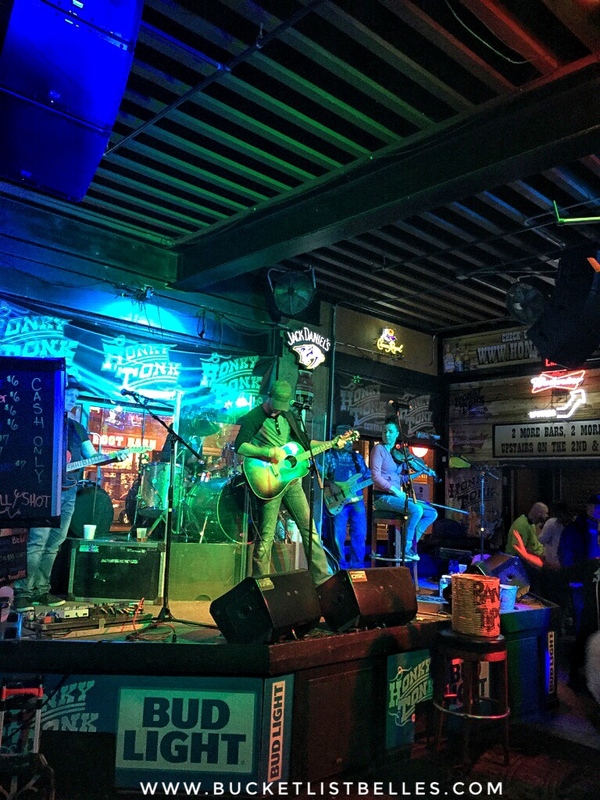 We stopped by lower Broadway in downtown Nashville, walked around and stopped by Honky Tonk Central for live music and drinks. Honky Tonk Central has 3 levels and each level is different music and different bands. Pick your favorite level and music, find a spot and enjoy the night with a beer. Other music venues recommended by locals but we didn't have a chance to stop by is Station Inn and 3rd and Lindsley. A weekend in Nashville was too short for us. We didn't get to go to Jellystone Park for light and music show drive-through (open Nov 4-Jan 1, 2017) or the iconic Country Music Hall of Fame and many other eateries on our list. We'll just have to come back to Nashville again! Put Nashville on your 2017 bucket list. Let us know your Nashville experiences and if you visit any of the places we did.